Wigs / Blog | All about Wigs / What Is The Wigs.com Experience? For almost 20 years, Wigs.com have been growing, expanding, and evolving to make your experience the very best possible. Throughout this journey, we have unveiled our core values, your specific needs, and married these with the latest in wig technologies, education, fast and efficient service and the best personalized care we can offer to what we’ve come to call the community. The Wigs.com Experience is Made Just For You! This experience is all for you. Although it’s the “Wigs.com Experience", it’s designed and built just for you because you are our passion. Here at Wigs.com, every step we take is made with you in mind. Before we make every decision, we first ask the question, “Is this best for the client?”. Here is a breakdown of The Wigs.com Experience and what it means for you! This starts at the very beginning of not only your journey with Wigs.com, but ours as well. We hire based on a series of standards that are unique and designed to capture only the most suitable and passionate candidates for job positions. And this standard is carried from the Client Service Specialists all the way to the video and production team, to inventory and even the web designers and technical positions. This way, nothing falls through the cracks and everyone is on the same playing field. Your playing field. Our team is an aggregated wealth of licensed cosmetologists, wig and alternative hair industry experts - or The Wig Experts™ - talented designers, careful and precise technicians and ultimately, the best in the business! At Wigs.com, we’re all about education. I mean, we are The Wig Experts, after-all. So, we have a whole team dedicated to producing videos with real people wearing wigs, hair toppers, and hair pieces helping you learn and navigate every single step of the way. From a 360-degree view of each and every wig, to tips on how to wear wigs and hair toppers, to styling and so much more! Wigs.com has taken huge strides to make the Wigs101 education cover all of the bases. Each and every brand offered by Wigs.com is tested and true to be amazing in quality, design, and style. Our premium brands are hand-picked by not just Wigs.com, but by you. When you ask, we listen! Every product and brand recommendation made by clients is carefully considered so that we always keep the lines of communication open. 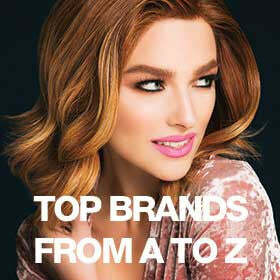 The wig brands available to you are the very best because you have great taste! This is why Wigs.com is the #1 retailer for wigs, hairpieces and alternative hair! Across the board, we continue to take the lead in customer service, efficiency, and quality. All of this is only possible because of you. If we didn’t have the amazing and clients we do, then we simply wouldn’t be Wigs.com! Perhaps the most important driving factor for us is the stories of women that have been through life-changing events like cancer and chemotherapy, or were born with conditions such as alopecia that cause them to have hair loss. When we hear a story about a woman whose experience was changed with wigs, we can’t help but know that this is our calling. So, we invited some of these women to the Wigs.com corporate office in Dallas, TX to share their story with you! You can watch these wonderful and inspiring stories here. One place to find some amazing support is our forum. If you aren’t already a member, it’s time to join! This is an area where you can ask questions, make new friends and find others who have common ground with you. You’ll see that people in all stages of their wig journey find solace, acceptance, guidance, and tons of fun communicating through the forum. Another place to find answers, is the blog! The Wigs.com blog is the very best source of news, education and pretty much everything wig and beauty related. Written by the founders of Wigs.com, The Wig Experts, and even members of the wig community like you, our blog is the daily place to get your wig fix! Many of our clients have medical-related hair loss. These stories make such an impact that we are asking women from the community to share their journey with us, so we can get to know you on a more personal level. In doing this, we have been moved and inspired. We've also discovered just how much strength and power you have, and how much you overcome every day. We are honored to share this journey with you and so grateful that you choose to share it with us! Go here to read some incredible stories from women just like you. Leave a comment and share what The Wigs.com Experience means to you. We would love to know!